Michigan offered two 2016 offensive line prospects this week. Who were they? The coaching staff received good news last weekend when a in-state prospect accepted a walk-on position. Who was the prospect? Which recruits will be in attendance for the Utah game this weekend? Find out in this Friday's version of "The Future Huddle"
On Tuesday, Michigan offered 5* offensive linemen Tommy Kraemer a scholarship. Kraemer, who is ranked as the #3 offensive tackle according to Rivals, already looks the part of a college lineman. Standing 6’5 and weighing 310 pounds, Kraemer is a coach’s dream. He has extremely long arms and possesses great footwork for only being a junior in high school. He does an excellent job of using his big frame to gain leverage on his opponents and rarely gets beaten. He’s extremely aggressive and does a great job of using his hands to keep defenders in control. In my mind, Tommy is one of the best offensive tackles in 2016. As of right now, I would guess that Kraemer’s recruitment will come down to a battle between Michigan, Ohio State and Notre Dame. Add in the fact that Tommy grew up a Michigan fan, you’d have to think the Wolverines are in good standing here. On Monday, DeMantha Catholic (Hyattsville, MD) 4* Offensive Tackle JP Urquidez received his scholarship offer from the coaching staff. Urquidez is a very intriguing prospect. Although he is just a junior in high school, JP boasts an impressive scholarship offer list with schools such as; Florida State, Penn State, Texas, Oklahoma, Baylor, LSU and Clemson. Currently his crystal ball is in favor of Baylor at 50%, followed by Texas 36% and Texas A&M 14%. "I've been in contact with Coach Mallory for the last few weeks or so," Urquidez said. "I was talking with him tonight and kind of asked him where things stood with Michigan right now because I'm interested in them and he let me know that I had a scholarship offer. 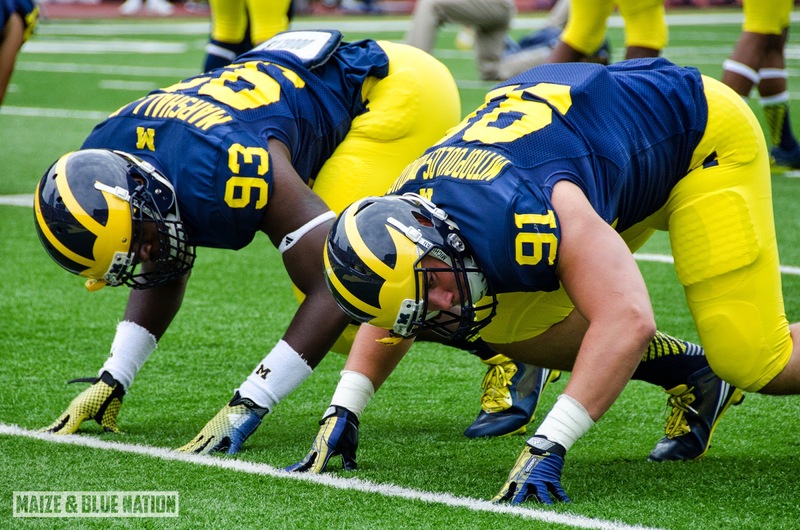 I'm excited about Michigan because they've always produced dominant offensive linemen. They're immediately high on my list now that I have an offer." JP is currently ranked as the #12 OT and #110 overall in 2016 according to Rivals. 2015 DE Jack Dunaway will join the Wolverines next year as a preferred walk on. Jack, who is the son of former Michigan Tight End Craig Dunaway, informed the coaching staff last Thursday that he would accept a walk-on position for the Wolverines. In my opinion this is great news for the coaching staff as they have an immediate need for defensive end recruits. Jack is currently unranked by both Rivals and 24/7. Speaking with 24/7’s Steve Lorenz, Jack had this to say about what he would like to bring to the table at Michigan. "I feel like I am a little bit undersized for the defensive end position at this point, but I make up for it with my motor and effort," Dunaway said. "Of course, I want to see the field as quickly as I can at Michigan. When I do get to see the field, I want people to look at me as someone who could give the team a spark defensively, and someone who plays all the way through the whistle"
Jack had 67 tackles, 17 for a loss, and 15 sacks as a junior for his Brother Rice squad in 2013. 2016 commit Erik Swenson had an absolute beast game last weekend, recording 28 (!) pancake blocks. Yes, that said 28. 2015 WR Damarkus Lodge decommitted from Texas A&M on Thursday morning. The Michigan staff offered Damarkus last January. 2015 DE Janarius Davis decommitted from North Carolina on Wednesday night. Current 2015 commit Brian Cole accepted his All American Jersey in front of family and friends on Wednesday. 2016 WR Donnie Corley picked up offers from Michigan State, Pittsburgh and Arizona State this week. 2015 OL Thiyo Lukusa announced via twitter that he will be announcing his college decision on December 1st. He will also release a Top 5 in November. 2015 LB Target Osa Masina will take an official visit to Arizona State on October 18th.